Adjustable Book Holder Helps To Reduce Neck Strain. Whether you're reading for pleasure, or using it to balance sheets of paper on while working on your computer, this holder will reduce both eye and neck strain. Say goodbye to the discomfort and frustration - say hello to your new adjustable book holder. 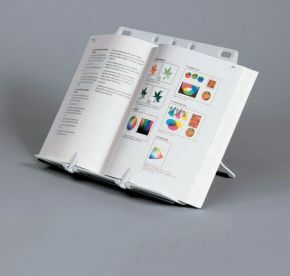 This easel-style adjustable book holder enables a user to read from any size of book at various viewing angles. With nine height adjustments it can be adjusted to provide any reader with a position of comfort to suit them. Two adjustable clips hold reading materials open and in place, and it can be folded flat for storage and portability. Measures 300mm (11¾") x 240mm (9¾") x 45mm (1 3/8") with a 38mm (1½") lip when open. I have found the Adjustable Book Holder very useful and comfortable to use. It prevents my hands from cramping when holding books. I would recommend this item. Initially, I thought it was a bit flimsy. However, having used it for a week or so, I am now really pleased with it, because it folds flat and can be easily taken from one place to another, and as I have to work in a number of different rooms each day, this has proved really helpful. I ordered an aluminium walking stick stool, which arrived promptly and well-packaged. I am very pleased with the item, which is sturdy and good quality.